So, let's have some fun, shall we? Now that I realize that replicator technology is being developed, I find myself speculating about how the replicator industry might work. Replicators will need three ingredients to work. 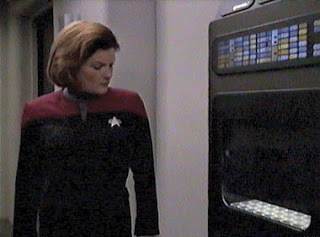 That's the replicator itself. The Economist article that sparked my musing about this technology analogizes this machine to a printer, and refers to the technology as "3-D printing". If that analogy is reasonable, and if this hardware follows the pattern of most types of high-tech hardware, then replicators might be expensive for a time, but will very rapidly fall in price while simultaneously improving in speed and capability. If they really become as cheap as printers (even high-end laser printers), we could expect them to start appearing in households, just as laser printers spread from offices to homes as the price fell. Over time they will get faster at making stuff, and able to make higher resolution objects, and able to use a wider variety of materials. In other words, they'll become get closer and closer to the Star Trek version of replicators. I agree with The Economist lede that this will revolutionize manufacturing. But I disagree with their speculation that the revolution will take the form of factories shifting to making small batches of highly customized products. Rather, it seems more likely to me that factories will disappear completely for vast classes of items. Instead, each household will just make small objects in their own personal home replicator as needed. The gain will come not from objects being highly customizable - why would I need a completely unique ballpoint pen or plastic cup? - but rather, from each household being able to make their own small objects as needed. And this would have, I think, possibly the most profound economic effect of all: the disappearance of the retail store. Imagine how often you would visit a physical Wal-mart if you had a replicator. A working replicator will need a design for each object that it can make. And for the designs, there will be a tension between the open-source route and the proprietary-design route. The Economist asserts that there currently seems to be some impetus for open-source designs. But I would be surprised if this were to last as the objects produced by replicators become more and more complex. For highly complex objects - suppose we use a ballpoint pen as an example - a tremendous amount of work will have to go into creating the design, because the design's resolution will have to be incredibly high. That's why I don't think it likely that replicators will lead to infinitely customizable objects - each tweak on a design will take lots of additional design work. Better to make a smaller number of designs well and at high resolution. But once the design is created, it can be sold to millions of potential users. Companies will specialize in producing the designs for objects that replicators can make. And then they will sell the designs, competing with one another on price and quality as manufacturing companies do today. This is how I imagine it. You need a ballpoint pen. You walk over to your replicator, and ask it for available designs of pens. You may be limited by the capabilities of your replicator (maybe a low-end version will only produce all-plastic pens, or pens that only write in black ink, while a high-end replicator can produce fancy ballpoint pens with metal parts), but given your replicator's capabilities you may well have a selection of pens that you could ask it to make. You review the designs for pens that are floating around out there (which the replicator can access via the internet, of course), you check the price of each pen design, and then you select one that you like. The design-maker takes electronic payment from you, immediately transmits the design to your replicator for either one-time or multiple use, and your replicator can get to work. I imagine that a competitive market will spring up for designs. (And of course, an active market would likely spring up for pirated designs as well.) In fact, most day-to-day advertising that people see could eventually be for object designs for your replicator. The only difference will be that the Bic ad will not be urging you to buy physical ballpoint pens at the store, but rather urging you to buy the design for your replicator. If we want to pursue the printer analogy (and I'm not entirely sure it's the best one, but for the time being let's go with it), replicators will need the equivalent of printer cartridges. But the inputs that the replicators will use to make objects will probably involve lots of different types of materials. Certainly to make a complex object like a ballpoint pen, one could easily imagine that it might take a dozen different incredient-compounds to produce it. The fancier that replicators get, and the more varied the objects are that they can make, the more different types of ingredient materials that the replicator will need. 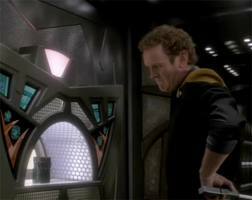 Eventually I could imagine sophisticated replicators having to be filled with hundreds of different types of compounds. I don't think the printer cartridge analogy would work, though, because it seems unlikely to be efficient to replace the entire suite of material inputs at once. More likely, there would be a way to individually refill the store of each ingredient-compound. But this brings us to an interesting implication: there would still be some important traffic in physical objects. Whether by delivery, pipeline, or a "grocery store" for inputs, homes with replicators will have to receive a steady physical supply of the materials that their replicators will use to build the objects that they make.